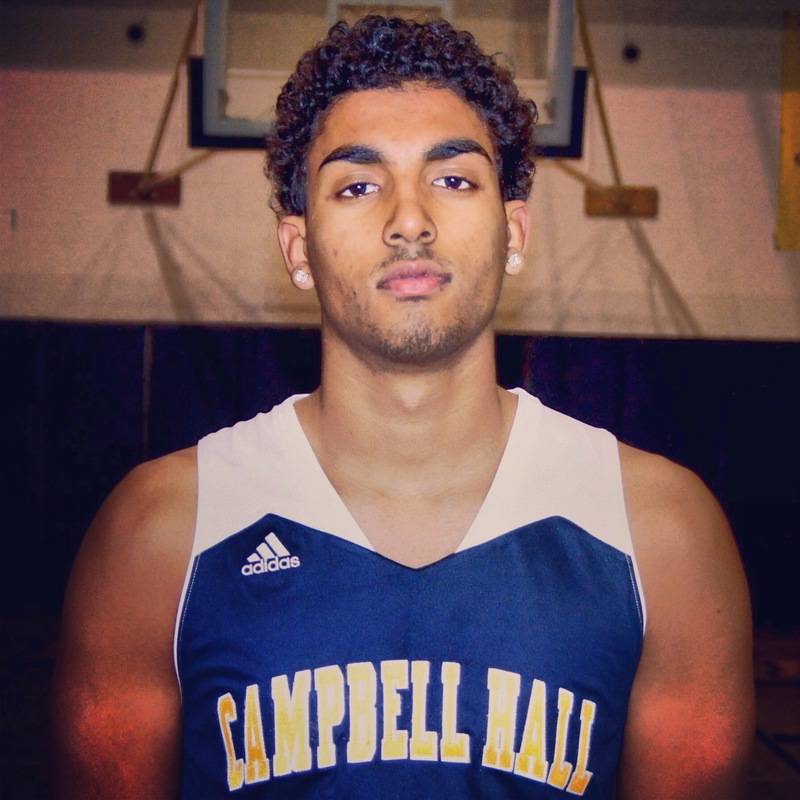 Explosive 2015 Combo Guard Kahlil Simplis of Campbell Hall HS in Southern Calif. Kahlil has been showing out recently grabbing major attention from college recruiters and media outlets. Mid Major Hoops Report has brought him to our “Players Corner” where we at MMHR are proud to highlight him as one of the fastest rising prospects in the 2015 Class…. Kahlil Simplis: I am 6’0 and weigh approximately 175lbs. Kahlil Simplis: I see myself as a Point Guard in college. Kahlil Simplis : I am going to be playing with San Diego Gamepoint. Kahlil Simplis: I am a high IQ, savvy, Pass-first PG who is a vocal leader on and off the floor. I am a sharp shooter and am always trying to help my team win no matter what it takes. Kahlil Simplis: I feel my leadership, pull up jumper, and my IQ are advantages i have over most players i face. Kahlil Simplis: I’ve definitely improved on the defensive side of the ball and wanting to compete on the defensive end of the floor. Kahlil Simplis: I’ve been focusing on playing off the ball and just improving my overall game. Kahlil Simplis: Schools that have shown strong interest are New Mexico State and CSUN have offered me. Im getting strong strong interest from USC, UCSB, USD, Harvard, Princeton, Brown, Cal State Fullerton, San Jose State, San Diego State, Portland, Santa Clara, Cal Poly, and UNLV. Kahlil Simplis: The coaches that have really made an impact on my family and I have been Coach J Hart Usc, Coach Hutson Sdsu, Coach Lowry from San Jose State, Coach Adam Cohen from Harvard, Coach Madry and Stock from UCSB, the coaching staff at CSUN and New Mexico State, and Coach Pruitt from Santa Clara. 11. Do you have a top five to ten schools you’re looking at right now? Kahlil Simplis: As of right now I am considering every college recruiting me. 12. What schools have you visited? Do you have any visits planned for the future? Kahlil Simplis: I’ve visited UCSB, Cal State Northridge, Cal State Fullerton, USC, UCLA, Pepperdine, University of San Francisco, San Diego State, University of San Diego, Cal, and San Jose State. 13. Would you prefer to play college basketball close to home, or is that not a factor for you? Kahlil Simplis: Its not much of a factor to me, wherever i am blessed to play college basketball is where il be. 14. How hard do you work on your game? How much time do you put in? Kahlil Simplis: I spend relentless hours in the gym bettering my craft. If you ask anyone who knows me they know im constantly in the gym. 15. How old were you when you first picked up a basketball? 16. What things are really important to you when it comes to choosing where to play college basketball? Kahlil Simplis: Definitely the education. That always comes first. Before i decide on a college i am going to sit down with my family to investigate which college is strong in the field of education i want to major in. After that it is also the community aspect of the team, the coaches personalities, and the fan base of the school. 17. Who are some of the mentors who helped you get to where you are right now? Kahlil Simplis: My dad, my mom, kids who are like my older brothers such as Spencer Dinwiddie and Nik Rhodes (who has the sickest in-game handles ive ever seen), and my AAU coach Sunny. 18. What’s your favorite moment as a basketball player so far? Kahlil Simplis: I have had some stand out moments as a basketball player. Scoring 35 on a torn meniscus in a tournament championship game when i was 14. As freshman, Aaron and I leading Campbell Hall to the state tournament, being a first since Jrue, his older brother, was at Campbell Hall. Getting that first offer was also a great accomplishment. 19. What are your short term goals as a basketball player? Kahlil Simplis: To definitely win a league championship. 20. What are your long term goals? Kahlil Simplis: To attend a Division I college playing the game i love. 21. Do you have a Facebook or Twitter that you’d like to share with us? 22. What style of play do you prefer? Kahlil Simplis: I love playing Uptempo and getting into early offense. I excel in transition, kicking the ball up quickly to teammates or attacking the paint fiercely and dishing it off to the big man. 23. Who’s a player in college basketball or the NBA that you really respect? Kahlil Simplis: I have the upmost respect for Spencer Dinwiddie, Ronnie Turiaf, Justin Cobb, DJ Shelton, Pe’Shon Howard, and JT Terrell. Working out and hanging with these guys all the time has benefited my game and getting advice from each individual is beneficial because they are and have been where i am trying to go in my basketball career. 24. Do you prefer Nike, adidas, or Under Armour? Kahlil Simplis: I prefer Nike. It has been a brand i have always loved. I also wear Adidas at times. Mid Major Hoops Report would like to say Thank You to Khalil Simplis and the Simplis family for allowing us to conduct this interview! Good luck on the rest of your season.